Lawyer-boxer's Blog: Instant replay? In boxing? Are they nuts? Instant replay? In boxing? Are they nuts? Wow. According to the CBC News, the International Boxing Federation has said it is open to the idea of using instant replay for boxing matches to debate referees’ decisions. I don’t like this idea. Boxing judging, scoring, and refereeing are subject to enough controversy as things stand; I don’t think the sport would benefit by the kind of second-guessing that instant replay and review would encourage. Football season is approaching; regular NFL games start on September 10. (For all you pre-season fans, those games begin this coming Sunday, August 9, as the Buffalo Bills square off against the Tennessee Titans at Fawcett Stadium, in Canton, Ohio.) I mention football because I’m not wild about the use of instant replay in NFL games. I’m even less enthusiastic about the specter of any role it might play in boxing matches. I might be missing something. What do you guys think? Do you see any value of using instant replay to review the ref’s calls? If so, do you really think it would fix things, or make them worse? The only way I can see it work would be for very specific things. 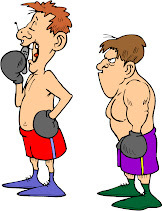 For instance determining if a guy slipped vs. a knockdown. But even then it would only work if they did not stop the fight, reviewed it in the background, then told us the result later and showed a video clip. Instant replay?! That's about as nutz as it gets... Part of the physical aspect is doing x rounds with x minutes break in between -- replays voids all of that. I see what "nerd" says about knockdown vs. slip but even if the ref gives a count - the judges ringside should know whether or not that goes down as a 10-8 round! It can only work if the fight is actually stopped (ie. maybe to confirm if a cut was from a good punch or an illegal elbow or headbutt). Crazy as a frog on a bicycle!